From the kitchen to the bathroom, tile floors consistently rank as one of the most popular flooring options for homeowners. There are tons of benefits that come from installing tile floors, including the fact that they’re less likely to cause allergies and preserve indoor air quality. At the same time, some people shy away from tile floors because they don’t want to deal with cleaning the grout in between the tiles. 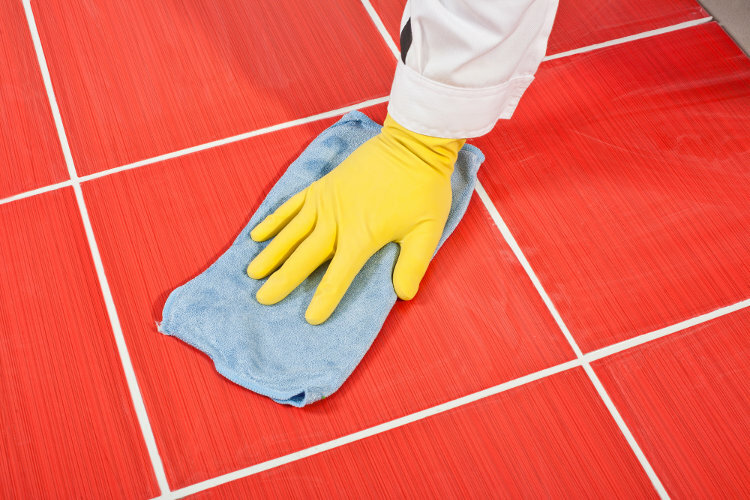 Grout cleaning might seem like a difficult task at first. But, if you keep these four simple tips in mind, you’ll find the process to be much simpler. Before you grab any fancy cleaning products, it’s best to start with just plain old hot water. Scrub your grout with hot water to loosen up and get rid of surface debris. This might seem like an unnecessary step at first. But, it will help you see exactly what you’re working with. It can also reduce the amount of time you have to spend scrubbing. Be sure to let the grout dry completely before you move on to the next step. When it comes to cleaning and maintaining your tile floor, it’s important to be particular about the types of cleaners you use on it. When choosing a grout cleaner, steer clear of products that contain bleach. Using these products on your grout could leave unsightly white spots. The only exception is if you have white or light-colored grout. You should also be wary of choosing cleaning products that contain vinegar. Grout contains cement, which has alkaline properties. Because of this, cleaning with acids can break down your grout. Look for a cleaning product that doesn’t contain either of these ingredients and is specially designed to be used on grout. You can also make your own grout cleaner by combining hydrogen peroxide, dish soap, and baking soda. The right cleaning tool will also make all the difference when you’re cleaning your grout. Avoid using metal brushes to scrub your grout. They’ll likely leave your tile covered in scratches unless you’re extremely careful. A nylon brush is typically a better option. It’ll still be tough on grout stains, but it also won’t scratch your tile. When you’re dealing with particularly stubborn stains, it’s time to bring out the baking soda. Sprinkle it liberally on the stain and let it sit overnight. Then, the next day, use your nylon brush to scrub away the stain. If baking soda doesn’t work for you, you can also use sandpaper to rub away hard-to-remove stains. These grout cleaning tips will get you pretty far when it comes to maintaining your tile floor. But, sometimes, you need to call in a professional to take care of particularly stubborn stains or more serious damage. If you live or work in the Warren, Royal Oak, or Rochester, Michigan areas, contact us at Motor City Carpet today. We offer a variety of floor repair and restoration services, all at competitive prices. Previous StoryReplace Hardwood Floors or Refinish: Which Option Is Best for You? Next StoryWhich Types Of Flooring Are Best For Cold Weather Climates?